New comics are due to hit the shelves on Wednesday so here’s a look ahead at some of the books we’ll be picking up this week along with a full list of titles that will be available from Paradox Comics. Andy H: Marvel make a bit of an impact on my pull-list this week: smashing its way to the top of my 'to read' pile is Immortal Hulk #13. 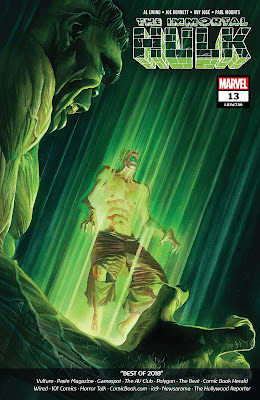 A consistently good read from issue #1, Al Ewing and Joe Bennett have brought something special to the green goliath. This has been a more disturbing take on a character I have followed for years. There's something quite unsettling about him now and Bennett's art just nails it. If ever a comic can have you 'sitting on the edge of your seat', this is the one, plus another stunning Alex Ross cover adds to the sheer quality of this title. Then, it's the return of Daredevil. Okay, so he hasn't really been away; the old series finished in December, then there was the five weekly issues of Man Without Fear in January and now, in February, there is a shiny, new Daredevil #1. There's very little information about the storyline but when the writer is Chip Zdarsky and the artist is Marco Checchetto it sets my 'must read' alarm off! Zdarsky made a real impression on me with his Peter Parker Spider-Man and Marvel Two-in-One runs. While they were quite light in tone I can't wait to see what he does with a character as gritty as old Hornhead. Still with Marvel, the return of the flagship X-title continues. Uncanny X-Men #11 reunites the previously dead Cyclops and Wolverine. There's always been a great dynamic with this pair of mismatched heroes and if it's down to them to save mutantkind you know things are going to get hairy. Moving away from Marvel I'm looking forward to more Dungeons & Dragons inspired fun with Die #3. Stephanie Hans' art is breathtaking and totally complements Kieron Gillen's writing. That leaves the best till last. Giant Days #47. Why isn't this top of the pile? Well, it's that good it has its own pile! This issue, mild mannered Daisy learns to drive but will there be enough instructors left to teach her? How can one person cause so many nervous breakdowns? Back at the student digs, Esther learns a secret about Dean. John Allison's plot and dialogue just oozes wit and charm and it's all brought to glorious life by Max Sarin's art. No capes, no powers, all class!